I've had the pictures for this tutorial on my computer for a while, but haven't had much time to write it up and post it. Now that I'm just under halfway through my 4000 word essay, well in word count anyways, I've suddenly found the time to write it up! I'm going to wait until I've finished my assignment before I post, just to ensure I get both things done this week. Update - I did managed to finish my essay on time, so hope you enjoy the your Easter holidays as well. One of the most important things about starting your own business is branding. Not big chain store type branding -splashing your name everywhere, but just a small little label that reminds people where they purchased your product from and how to google you at the very least. Sometimes, well most times, I forgot to add labels to my items, and I make the effort to unpick a few stitches (another reason my stitch picker is my best friend) and tack on a tag. All you need is that one person to show a friend their newly purchased handmade craft item, and check the tag to tell them where it is from to secure another sale. If you don't have a label then that is a lost sale to you directly or indirectly. That one friend might decide to go on etsy and search for an ID wallet lets say, but instead purchases one of the 100s of other options available in the search category. Moral of the story - labels are important! Even more importantly they are cheap to make. 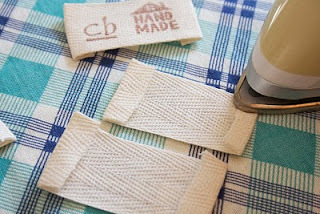 The are multiple ways for making fabric labels on the cheap. 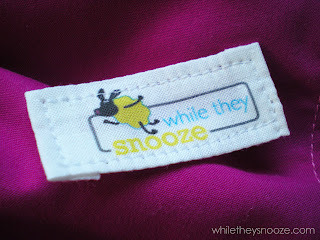 You can order custom made woven labels from numerous sellers on the interwebs or you can DIY. 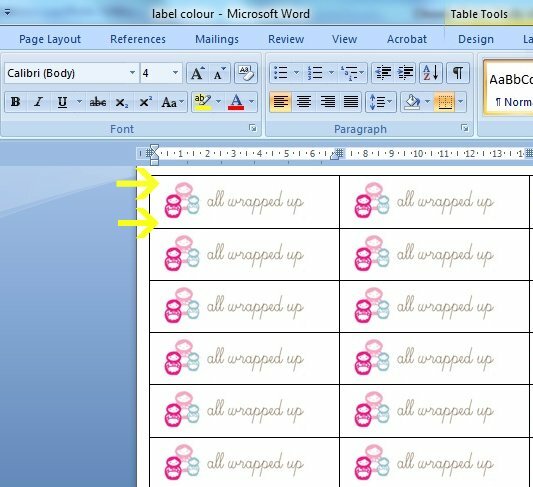 The best thing about this method is that you can make a small number of labels to start with, it can be a scary prospect to invest money in 300+ labels when you are just starting out with your design and business. **if some of the pictures are a bit blurry - click on them to view them in a better resolution. 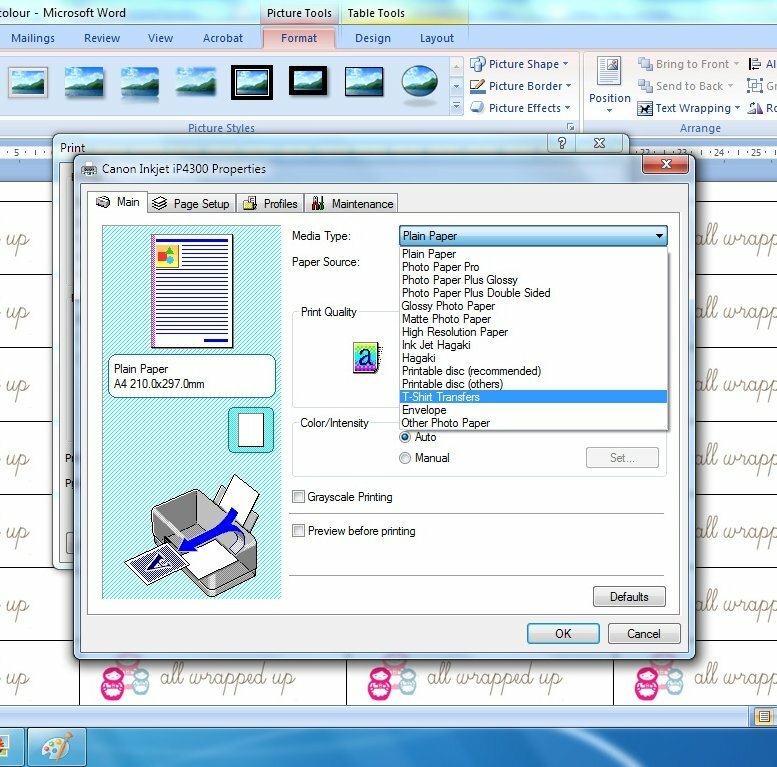 First you will need to design your own fabric label image. You can just have text alone or text and an image. 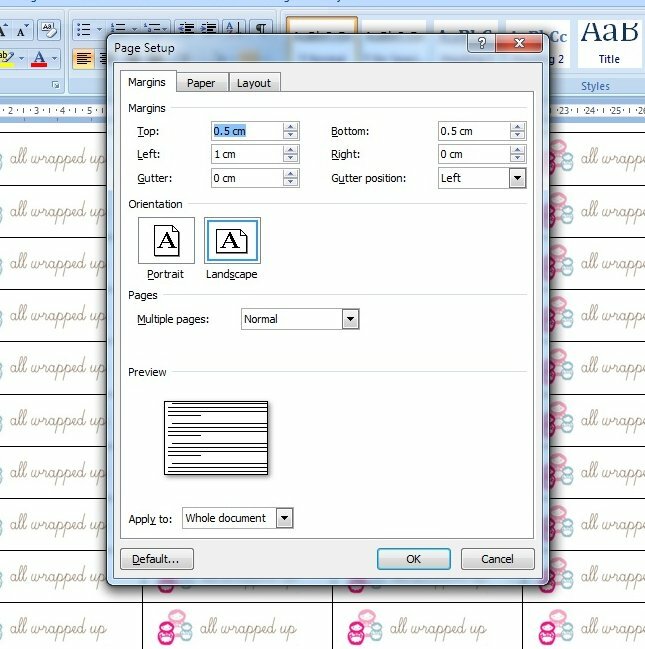 Opening Word (or whichever word processor you use) set up the page margins so that they are 0.5cm from the page edge. Rotate the page so it is in landscape view. Now make a table with 4 columns x 10 rows. I cut my actual image with 1mm extra width and height on each side. The size of my pasted image is 16mm x 66mm. Copy the image through the table. Press enter above the image. And press enter again below the image. So there is a extra line above and below the image - to allow for more cutting space. I'm not so good with scissors. Now to prepare your image for printing. The labels actually needs to be printed in their mirror image so that when you iron it to your fabric, it will be the right way round. 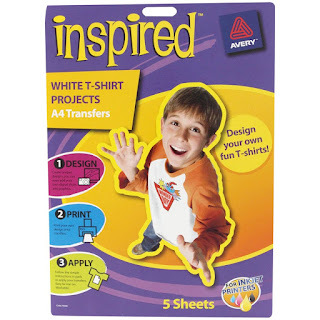 If you have a newer model inkjet printer there may be a setting for t-shirt transfers. 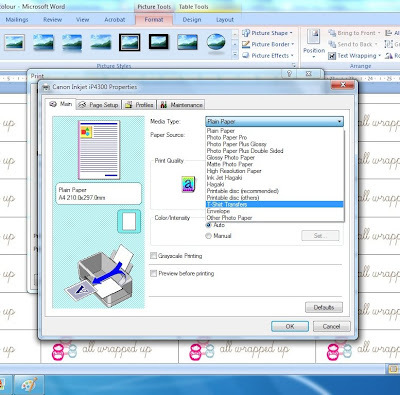 If you don't have this option available on your printer don't fear - there is a really simple way to flip the image. Select the image, and under the format tab select rotate image. 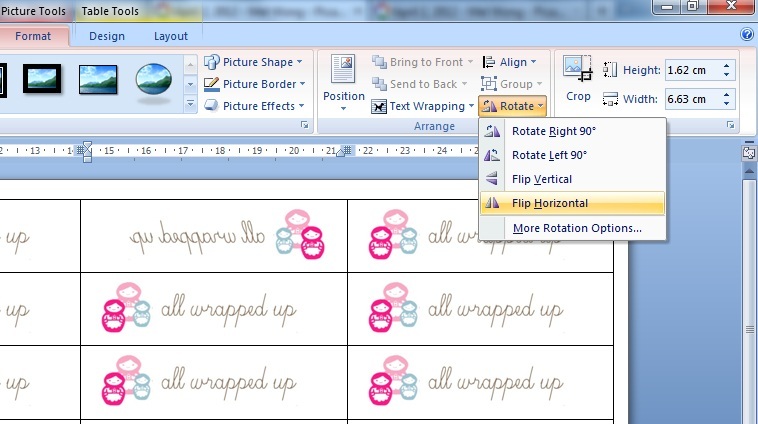 There will be an option to flip horizontally. This will give us the mirror image. Now copy this mirror image throughout the table. 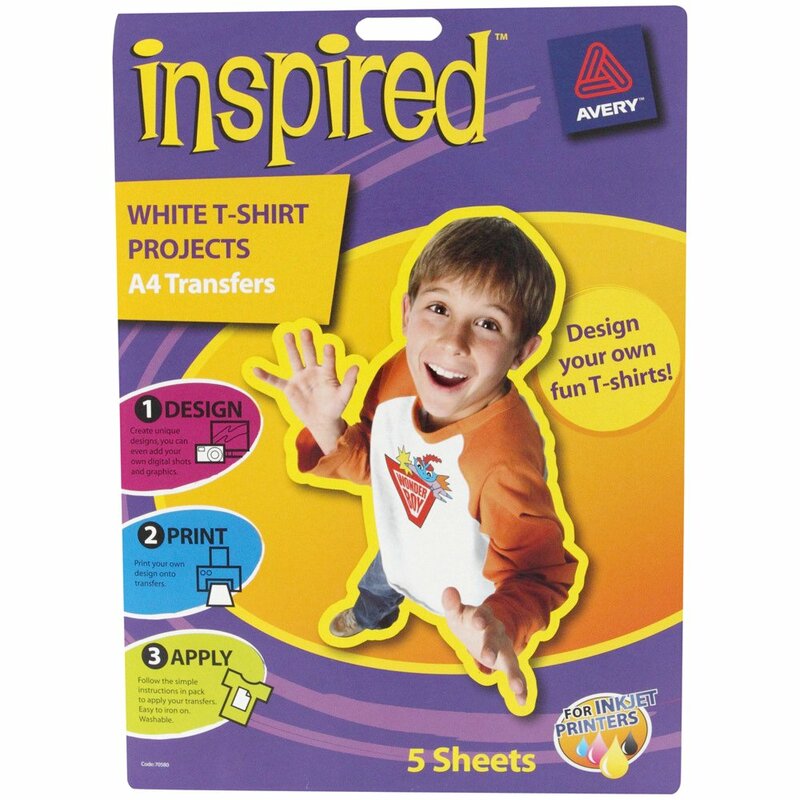 Now place your t-shirt transfer paper into your ink jet printer. With the white side up. Most t-shirt transfer papers have a plain white side and a design on the other so you know which way to feed the paper. The first time I used the transfer paper I fed it in the wrong way though. And when I attempted to iron it to my fabric, I ended up with glue all over my iron and a distinct chemical smell. Once you have printed your transfer, leave it to dry for a couple of minutes. Cut out each of the individual transfer labels. Heat up your iron to an appropriate setting for satin ribbon. Pin the end of a roll of ribbon to your ironing board and pin around a meter to the other side. On a side note, most of the printer label instructions state you will need a hard surface to iron on, specifically not an ironing board. You will notice how gross looking my ironing board is and that is because it is the base cover. I have an extra cover for ironing my clothes but this base cover barely has any protective padding in it left, so it's a pretty good hard surface for ironing. 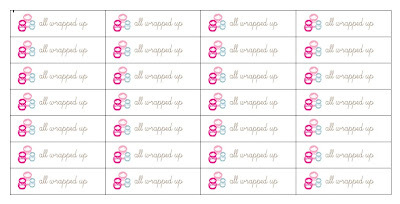 Place a few of the cut out transfer labels, printed side down on top of the ribbon. Once you have a few of the labels stuck down to the ribbon. Place your iron parallel to the ribbon and press down hard on top of the ribbon for a good 5 - 10 seconds. If you want to check if the label has been ironed on well enough you can slowly peel off the transfer paper from one corner. It should come off easily without resistance. If not pop the paper back on and iron again. When you cut the ribbon it is very likely that it will fray. Even if you cut the ribbon where the transfer overlaps. Do you remember the trick your mother likely taught you to stop hair ribbons from fraying? Well mother does pretty much know best (in this case anyways). Light a small candle and grab one of the cut ribbon labels. Placing the ribbon around 0.5cm from the flame. Watch as the edge of the ribbon melts slightly and seals the edge. Don't put the fabric directly in the flame, you basically just want the heat of the flame to seal the edges. This is the reason I prefer to use synthetic ribbon as the long sides are woven close and the two short sides are easily sealed with a candle. Now keep on ironing till you have finished the 40 labels you have just cut out. The best part of these labels is that you don't need to iron over any excess fabric and burn your fingers in the process and they don't fray once heat sealed. Not only am I bad with scissors, I'm also pretty bad at using my iron for fiddly projects. On a side note you can probably also use fray check to stop the ribbon from fraying. I did try clear nail polish but it looks shiny on the sides. Twill tape would work well with fray check but as a natural fibre it will burn when put near a flame. thanks for sharing! this is a great technique, I will try it. Thanks for stopping by and commenting. The best thing about this technique is that you can try a few different label styles before committing to one. 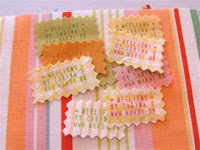 You can even make them into personalised name labels for a gift recipient. Thank you for stopping by and commenting. 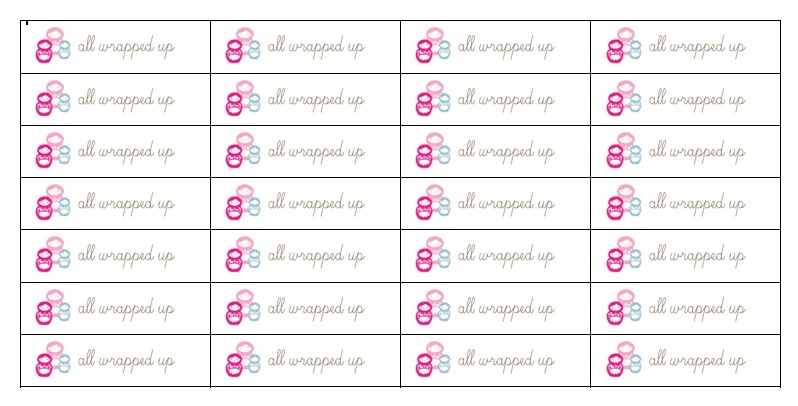 The only other thing I can suggest for making fabric labels is to try a few different styles and ribbon sizes. You can use wider labels with just your label icon for certain items if you need a hanging tag on the outside. Okay, I have to say, this is pretty neat! Thanks for sharing! Thanks for stopping by and commenting. Hope this helps you with making your own labels. Great idea! I'll bookmark this. I've lately wondered how I could make my own affordable labels for a few handmade items I want to sell. But I'm still a step ahead of myself: I haven't even come up with a brand name to put ON the labels! That'll be the hard part. Thanks for stopping by and commenting. I totally sympathise with the trying to think up a brand name and icon. What about your blog name? A really good place to start for icons and pretty fonts are digital scrapbooking websites; I posted a few for a different post here (http://mel-allwrappedup.blogspot.com.au/2011/04/cheap-fabric-new-craft-finds.html). Otherwise etsy has some graphic designers that can design your logo and etsy banners etc. But the best thing about this tutorial is that you can jut play around with a few and give them a go without committing to 200+ labels you might never use. Thanks so much for the tute, and the link roundup too! I've been looking for a way to replace my fabric labels (currently running low, also I'm making them by snipping the given name off the twill-tape labels my grandmother used to label my uncle's clothes for Boy Scout camp in 1968, so they are lacking somewhat in pizzazz). I'm excited to give this a try! Thanks for stopping by and commenting. 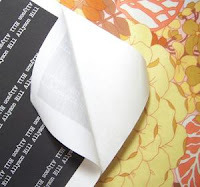 I have definitely tried twill tape too, But it frays and my fingers are too clumsy to iron down all the edges evenly. And the nail polish thing was ok for a while but smells funky when you store them all together in a closed jar. Would love to see what you come up with for labels. Also just checked out your blog - definitely thought about Alan Rickman in my last ten thoughts. Hehehe....Alan Rickman. You should check out this pic (http://pinterest.com/pin/105482816241894306/)it's a screenshot of a what an Alan Rickman as Snape GPS would sound like. Made me LOL - actually though. I found you on Pinterest. This is a great idea and I'm definitely going to try it out! Thanks for the inspiration! Thanks for stopping by and commenting. Glad you found the tutorial helpful enough to give it a go. Would love to hear how you went. I made these labels tonight and they are awesome! Great tute!! I do have a question, though. I make microwave heat packs and I was wondering what kind of label you suggest.. I can put these on the removable covers but I fear that people will not take the cover off before heating them and that would cause the label to melt. Any suggestions? Thanks for taking the time to stop by and commenting. I'm glad that the tute worked for you. It's very satisfying to see a bunch of neatly made labels with your brand name on it ready for use, isn't it? I understand the worry about the labels in the microwave. I ironed over mine and it went a bit gross. The first thing I would suggest is microwaving the label on a bit of similar fabric and see what happens. Just watch it and start with 5 seconds and increase it. The other thing you could do is add a warning label to the actual fabric label to say "TAKE OFF THIS COVER BEFORE MICROWAVING!". Otherwise maybe the stamping method might work? If I have a light bulb moment I will post another reply, but at the moment drawing a bit of a blank! Definitely need to get my printer working so I can try this!! can i know what is the size & the wording that you using it? I would like to try out! Thank you so much for stopping by and comments and for you lovely comments on the patchworky bifold wallet post! I used a free download font called "Skryptaag Tryout" size 28 for my labels. Would love to see how your labels turn out! Valuable information ..I am delighted to read this article..thank you for sharing. Do you make bows using these Printed Ribbon from Yama? I like them either. I usually Wholesale Ribbon from them. It's a great choice. I wonder how these will hold up to wash and wear when they are put in kids clothing. This is so creative! I would have never thought to print a custom label on ribbon but it makes complete sense! Thanks so much for the tutorial! Thanks for sharing this article, its been a really interesting read. I've never dealt much with labels in Ottawa, like this before. I'm curious to see how it's all going to work out. But, thanks again for sharing! Can you wash these labels? I would like to put then on washable items. Thank you! This has been a fabulous tutorial! No matter how hard I try I cant flip my text! right now its just simply typed into the table but i've also tried putting the text in a text box and still nothing! Help if you can! Thanks for this post, I have been searching for DIY solutions to use for a budget wedding. This tute helped a lot. Thanks! Hello, I was wondering if you could do this with Freezer paper? I'm not too sure if the colour will keep as well on freezer paper. I have seen tutorials out there that do use this method though. 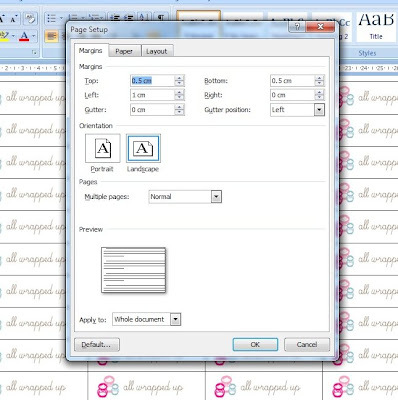 This will do so helps to create own fabric labels. Amazing idea and thanks for sharing. The perfect thing that I like about this blog is the way it is written. You have explained everything in an easy manner. Label Printing Company Thailand. The blog was absolutely fantastic! Lot of information about sticker printing Malaysia is helpful in some or the other way. Keep updating the blog, looking forward for more content...Great job, keep it up. Good blog and you have described in a very nice way. Thanks for providing such an informative blog. You can find more about sticker printing in our website. custom printed stickersAt Stickerbeat we print high quality custom stickers, kids stickers, wedding & event stickers, decals, and magnets of all shapes and sizes. Great Post! Thanks for your share! We are Wholesale Satin Ribbon Supplier that you can get ribbons with 196 colors and 19 sizes with the best deal from!